Kemdent manufacture a range of cements and liners based on Zinc Oxide B.P. Powder and Eugenol B.P. Liquid. This popular, established range of products are economical, quick and easy to mix, providing a range of fundamental, reliable materials for the dental practice. 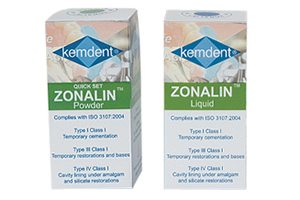 Alganol and Zonalin are globally recognised faster setting Zinc Oxide Eugenol Cements.